Szilvia Nyusti and Péter Takács are blind advocates in Hungary who wanted OTP Bank (the largest bank in their country) to install Talking ATMs. After all, they paid the same fees as sighted customers, shouldn’t they have the same access to services and technology? After a five year legal battle in Hungary, they took their claims to the United Nations. On May 16, 2013, the UN Committee on the Rights of Persons with Disabilities issued an historic ruling finding that Hungary violated the UN Convention on the Rights of People with Disabilities (CRPD) by failing to ensure that Hungarian banks had Talking ATMs. Jump to the article below about the UN Talking ATM ruling. Congratulations to Szilvia and Peter. Congratulations to the United Nations. Congratulations to the Convention on the Rights of People with Disabilities for working as it should in protecting the rights of people with disabilities. 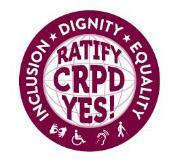 Learn more about current efforts to ratify the CRPD in the United States. The first Talking ATM was installed in the United States in 1999. Learn more about Talking ATM History. The UN recommended that Hungary establish “minimum standards for the accessibility of banking services.” Learn more about Talking ATM regulations in the United States. One of the newest United Nations human rights treaty body, the UN Committee on the Rights of Persons with Disabilities, issued an unprecedented decision on a case involving Szilvia Nyusti and Péter Takács, two visually impaired complainants from Hungary. Seven of the human rights treaty bodies (the Human Rights Committee, the Committee on the Elimination of Racial Discrimination, the Committee against Torture, the Committee on the Elimination of Discrimination against Women, the Committee on the Rights of Persons with Disabilities, the Committee on Enforced Disappearances, and the Committee on Economic, Social and Cultural Rights) may, under particular circumstances, consider complaints or communications from individuals who consider that their rights have been violated. The ruling of the disability rights body was made in favour of the two plaintiffs who, under article 2 of the Optional Protocol to the UN Convention on the Rights of Persons with Disabilities, put forth the “failure by [Hungary’s] authorities to eliminate discrimination on the ground of disability by a private credit institution and to ensure that persons with visual impairments have an unimpeded access to the services provided by the ATMs on the equal basis with the other clients”. Both claimants were clients of the OTP Bank Zrt. and paid annual fees, equal to those paid by sighted clients, for banking card services and transactions. However, Nyusti and Takács were unable to use the OTP ATM machines without assistance, as the keyboards were not marked with Braille fonts, nor did they provide voice assistance. In April 2005, the plaintiffs’ lawyer lodged an unsuccessful complaint to the OTP Bank, requesting for ATMs in the proximity of his clients’ homes to be retrofitted for their unrestricted use. Five months later, Nyusti and Takács brought a civil action to the Metropolitan Court where they asked the court to recognize that OTP was violating their right to equal treatment under the Hungarian Civil Code – in particular the Equal Treatment Act, and to request a Court order to retrofit part, if not all, of the ATMs operated by OTP across the country. Six months later, OTP requested that the civil action be dismissed, stating that the extra services demanded by the plaintiffs would constitute positive discrimination, which could only be prescribed by law. The bank also claimed that it was primarily a governmental obligation to ensure unimpeded access to buildings for persons with disabilities and that the ATMs operated by the OTP were not “buildings”. The bank further claimed that since both contracts were concluded by the plaintiffs prior to the entry into force of the Equal Treatment Act, the latter was inapplicable to their case. In May 2007, the Metropolitan Court ordered the OTP to retrofit within 120 days at least one of its ATMs in the capital towns of each county, one in each district of Budapest, and four further ATMs in the districts where the authors resided. However, the plaintiffs went against this decision at the Metropolitan Court of Appeal, asserting that their activities should not be limited to the cities where the ATMs were to be made accessible following the decision of the Metropolitan Court, as they were entitled to freedom of movement and the right to choose their place of residence. They requested that all OTP ATMs be made accessible, to end the discrimination fully and not partially, arguing that the operation would not constitute a significant financial burden to the bank. The appeal was rejected. In April 2008, the plaintiffs submitted another request, this time to the Supreme Court, hoping to have the decision by the Metropolitan Court of Appeal overturned. The OTP Bank, on the other hand, pleaded for the decision to be upheld, claiming that the contracts signed by both plaintiffs confirmed their acceptance of the conditions in which the bank’s services were provided. Practically a year later, the Supreme Court rejected both requests, sharing the opinion of the Metropolitan Court of Appeal. After a five-year legal battle, judging that they had exhausted all domestic remedies, Nyusti and Takács filed an individual complaint against Hungary through the UN committee in charge of protecting the rights of persons with disabilities. The complaint sought to substantiate the failure by Hungary, through its institutions, to provide “equal and effective legal protection against discrimination on the ground of disability; reasonable accommodation; accessibility of information; right to control one’s own financial affairs.” It claimed that Nyusti and Takács had been victims of a violation of their rights under articles five, 9 and 12 of the UN Convention on the Rights of Persons with Disabilities, to which Hungary is a party. After having considered the admissibility and the merits of the claim, the Committee concluded that Hungary had failed its treaty obligations under article 9, paragraph 2(b) of the Convention. The Committee established that “the State party is under an obligation to remedy the lack of accessibility for the [plaintiffs] to the banking card services provided by the ATMs operated by the OTP.” It also recommended that Hungary take preventive measures against future violations by establishing minimum standards for the accessibility of banking services provided by private financial institutions for persons with visual and other types of impairments; to ensure that all newly procured ATMs and other banking services are fully accessible for persons with disabilities; and provide for appropriate training on the Convention and its Optional Protocol to judges and other judicial officials in order for them to adjudicate cases in a disability-sensitive manner. This year marks the 20th anniversary of the World Conference on Human Rights, which led to the adoption of the Vienna Declaration and Programme of Action, and the establishment of the UN High Commissioner for Human Rights to oversee the international human rights framework, promote human rights and protect individuals against abuse. There are ten core international human rights treaties, some of them being supplemented by optional protocols dealing with specific concerns. The Convention on the Rights of Persons with Disabilities was adopted by the United Nations General Assembly on 13 December 2006, and opened for signature on 30 March 2007. Following ratification by the 20th party, it came into force on 3 May 2008. In the past two decades, individuals have been given far more access to international and regional institutions, and are entitled to report violations and demand justice. This is a post about ATMs that talk so blind people can use them. Advocates in Hungary used an international treaty to convince banks in that country to make ATMs talk. The treaty is called the Convention on the Rights of Persons with Disabilities, or CRPD. A group in the United Nations said that the CRPD required equal access to ATMs.